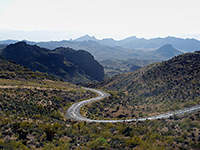 The 52 mile section of Route 66 between Topock and Kingman is the most spectacular remaining in Arizona, or perhaps the whole Southwest - the road crosses empty, cacti-strewn desert and the rugged Black Mountains, passing several old mining towns and other evocative ruins. In places the road is very steep and winding, so difficult for traffic that US 66 was at one time re-routed across flatter lands south of the mountains, where I-40 runs today, and it is from the interstate (exit 1) that a drive along Route 66 begins - see map below. 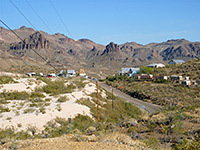 Topock is a tiny place of just a few houses, looking out over the marshland of Topock Bay beside the Colorado River; a few miles north is the small residential community of Golden Shores, where the main road (AZ 95) branches off westwards towards Bullhead City, and old Route 66 continues due north. 16 views along Route 66 between Topock and Kingman. The largest town with hotels near this part of Route 66 is Kingman - follow the link for descriptions, map and reservations. Driving away from Golden Shores, the surface soon becomes cracked and bumpy as the now very little used road crosses flat, desert land of dry washes, sand dunes and low, bushy hills. Many rough tracks lead off on both sides, some marked by rusty cars and other abandoned items, and all providing good places for free primitive camping. The land gradually rises as Route 66 approaches the Black Mountains, and teddy bear cholla cacti start to appear around 1,400 feet, most conspicuously beneath Boundary Cone and McHeffy Butte, two detached hills right next to the road. 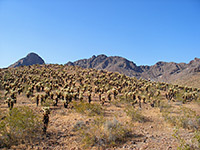 Otherwise, vegetation hereabouts is limited to the ubiquitous creosote bush and the occasional yucca. There is a disused mining area just south of the cone - many shafts, tunnels and spoil heaps are spread out over the lower slopes of the hills, plus rusting cars and iron machinery, and evidence of former habitation including at least one grave, of a man called Leonard. The area is rather sad and eerie especially as so few people seem to pass by on the road. The mine tunnels are carpeted by old cholla spines several inches deep in places which makes exploration difficult, though many relics can still be seen, either inside or scattered over the ground. 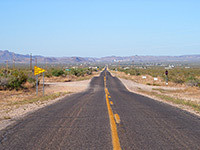 Beyond the mines, another road joins from Mohave Valley in the west and Route 66 becomes a bit wider with slightly more traffic. It soon passes through Oatman, a very authentic old west gold mining town with original wooden buildings and raised walkways - there are no pavements here, and cars have to park on the narrow street, often competing for space with wild burros, who wander at will along the road. Oatman has many abandoned buildings - maybe one in two are empty and derelict, making it a semi-ghost town, though some businesses are thriving because of the ever growing tourist market, and most of the vacant properties are guarded by fences and No Trespassing signs. The population is currently estimated to be about 150. Most houses have a great selection of bric-a-brac outside including old cars, rusting iron machinery and disused household appliances, with similar detritus visible inside through the windows. North of Oatman, Route 66 makes a short but steep climb further into the mountains, passing the more genuine ghost town of Goldroad, but the site is now occupied by a working mine, and for 1.2 miles the land is private property, however there are plenty of remains of old mines and buildings to be seen, amongst the cacti and boulders at either side of the road. Route 66 crosses the top of the Black Mountains via Sitgreaves Pass (elevation 3,523 feet) - a ridge that has great views both west to Bullhead City, the Colorado River and southeast Nevada, and east towards the flat Sacramento Valley and Kingman. There are several places to camp around the pass, which is noticeably cooler than the desert below. In fact the whole of this part of Route 66 is unfenced and there are many small side tracks and pull-outs where overnight stays are possible. The descent towards Kingman is scenic but steep and twisting, as the road drops down into a rocky valley where several active mining claims are still being pursued, by lone prospectors living in rough shacks in the hills. The surroundings become empty of all development for a few miles until Route 66 emerges from the mountains into Sacramento Valley, a wide, level expanse crossed by a grid of dirt roads along which are many buildings, quite well separated. A good proportion lie empty and abandoned, their contents scattered about over the desert, rotting and rusting in the sun. The houses are generally larger and in better condition further east, as the road approaches I-40, meeting it at exit 44. Route 66 continues on the far side of the interstate, curving through a short, narrow ravine and entering the historic downtown area of Kingman, turning eastwards and running alongside the BNSF railway. Next section of Route 66: Kingman to Williams.